That's right! I'm starting over! If you are wondering where all the old stuff is, I've moved it to a subdomain, OLD.JRCharney.com. I've probably broke a bunch of stuff moving the old stuff, but I'll fix it shortly so I works like it used to. But don't be a stranger! I'm online through other means. I've been busy while this site was in limbo. Check out what crazy code I'm tinkering with on my Codepen website. Follow and checkout the various Github projects I've been doing on my Github profile espeically my Hacktop and PLUSHES projects. My blogging operations, which used to be this website's reason for being, have since moved to Medium where a bunch of other geeks have been doing it lately. There's probably a few other things I haven't mentioned, like I'm trying to get my Cisco Certified Networking Academy certification at St. Louis Community College, I had been hanging out at Venture Cafe on Thursdays at Cortex now that there's the Metrolink stop there, and I'm kind of a regular at TREX downtown. But most importantly right now, I need MONEY!. This website is not a business. I would have loved to have monetized it years ago to make is a business with ads and sponsored content of things that I'm interested in years ago, but for the most part this website is just a passion, a "hobby". And while a lot of people choose to venture out and dive into filling out the LLC paperwork and registering as a business, I bought my first domain back in 2003 just because I though it would be cool to have my own website. Later, I replaced the domain name with my own name, because I wanted to let everyone know who I was, promote my skills, and hopefully lure the attention of someone interested in hiring me for those skills. Not everyone does there research to start their own website, find an affordable webhosting company, then write all the code by hand. These days, a lot of people buy a website from a company that has the code prepared for them in cookie cutter fashion (i.e. SquareSpace), then hires some guy who barely do any work to fill the website with content. At least when they do it, they are being paid like $200 per hour for doing something that is the computer programming equivalent of just mowing someone's lawn. While I do run this website all on my own, and it cost me about $20 per month to run it, the primary reason it exists is to flag down so tech company folks to say "I am here and I want to work for you!" However, I'm at the point where I need to say "OK, if you're not going to hire me, could you at least chip in a couple of bucks to support my interests?" Which is why I have the ribbon and this button on my temporary home page. I mean, six years a college shouldn't be followed by nearly a decade of bad luck which included two crappy job where at least one boss didn't pay me all my wages. 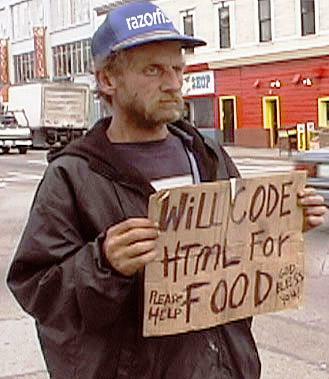 Nobody who is highly educated, should be doing what this guy in this photo is doing to get a job in the United States. It's all funny until you realize it is real. Yes, that is what is happening in this country! It's not a joke anymore! There are folks out in the street or taking crappy jobs because people don't look at resumes, cover letter, letters of recommendation, or even websites. They look at networking and connections. People who go to the events, the hackathons, and the weekly get-togethers. That's why this website needs to be renovated. Not to be a place where I shoot the breese on things I'm passionate about. But to show people how dedicated I am to wanting to get that job I worked so hard to obtain, even if my skillset isn't 10 years of whatever really old software product nobody has ever used or practiced with during their academic, vocational, or professional training. I use the open source stuff, not because of a dislike of Microsoft, Apple, or whatever big tech company is out there raking in the billions of dollars, but because I simply don't have $3000 to pay for a computer and it is so unplesant to have your computer serviced by other people when I can do something to fix it myself. Could you believe I was turned down for a job once because I didn't own a Mac?! That's like someone at Burger King saying you can't work for them because you didn't eat a Whopper everyday. Besides, do some research on the hardware specs of any Apple Product compared to any PC on the market, espeically component. If it wasn't for all these Bitcoin bozos, graphics cards wouldn't cost more than the rest of the computer components that you can buy and build your own PC (which I've done twice but had to settle for a mother board with on-boad graphics. Well, three times if you count my hacktop.). "unit testing" — Basically code debugging or refactoring, ideally before putting a product into production, but is never really done until the programmer tells his manager "I told you you should have let us test this out before you sold it, now enjoy paying for patching or worse an expensive product recall", but someone just made some software to make them feel special. "business logic" — Writing the code that does some SQL database stuff. Could you believe I took a class on how to write programs for businesses and for some reason or another those two words never were in the same sentence together until I had an "uh-oh" moment when someone had to explaind to me what that term meant. Of cours that was over a decade ago, and I know now what it means. "machine learning" and "artifical intellegence" — You would probably think with that second term "oh, robots, cool." In reality, it's stuff that has been theorized for almost a century, implemented a few decades ago on some really expensive hardware or published in some overpriced Elsiver publishing book that the late Aaron Swartz litterally had to pirate from JSTOR so that everyone could finally learn what it is, and dumbed down to a consumer level because people are afraid of "big scary robots" marching down the street enslaving humanity. (If you look at history and see how humans have treated each other, who needs robots to enslave humanity when humans do a pretty good job of doing that themselves. So I for one welcome our robot overlords.) These two are quite possibly the biggest braggadacio programming trend right now. (I included a link to what "braggadacio" means so that nobody thinks it's a curse word. And I got called into an office once for using the word "default" in a sentence.) So let's clear the air here about what these two terms are. First, "machine learning" is basically all that vector calculus stuff from high-school calculus combined with a little bit of statistical probablity that you could probably have learned on your own if your school could ever find a guy to translate any of it from Nerd to English, but because they don't hire guys like me to do that, they just cut that out and spend the money they should be using to do some science thing that is life enriching for some million-dollar track the athletic department never requested. The other term, "artificial intelligence" is basically applied machine learning, which really isn't being applied to anything practical which is why the only thing my Google Home Mini is good at is toggling the lights in my bedroom, assuming it heard me the first time, and doing several other things that an alarm clock radio used to do. Stay tuned, changes are coming for the better! JRCharney.com © 2003-2018 | Send an email, let's talk!